Shada Brazile has been modeling since she was 14 for lines like Wrangler, Cruel Girl, Justin, and Cripple Creek. 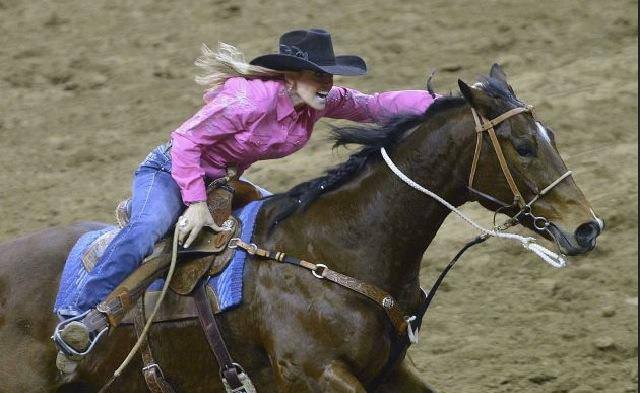 Her husband, Trevor Brazile, has been winning rodeo championships for years. The hard work that made these two the quintessential Western couple took an even more Western direction when that they had a baby. With Trevor as all-around inspiration and little Treston as male model, Shada brought the Western sensibility to a new generation with All-Around Baby, a line of Western infant clothing that she launched with Wrangler. Trevor and Shada Brazile weigh in on their favorite things. Trevor: I’m a big fan of George Strait. He lives the lifestyle, he is a cowboy, and he also is able to pull off the country music. You gotta appreciate somebody who can sing the song and walk the walk, you know? Shada: Kutless, Third Day, Bon Jovi. Trevor: Del Frisco’s, Rosa’s for Mexican, and Outback Steakhouse. Shada: P.F. Chang’s, Chili’s, and Outback Steakhouse. Trevor: Pendleton — it’s so different than any other rodeo, being on the grass. Cheyenne — the tradition never dies around there and I always dreamed of being there. Calgary — they’re the only rodeo where you can win about $120,000 in one rodeo, and the fans are a massive gathering. Shada: Cheyenne — it’s my favorite because I’ve been going there since I was a kid. Bremerton, Washington, because it’s beautiful, surrounded by trees, and they provide a huge cookout luncheon for the contestants. Corpus Christi because they have a really cool athletic club. A version of this article originally appeared in the December 2009 issue of Cowboys & Indians. Find more at www.cowboysindians.com.